DECT stands for Digital Enhanced Cordless Telecommunications. Which is basically the technology that allows you to have a cordless phone either at home or work. The DECT 6.0 technology is only involved in making the phone cordless and you will still need some type of phone service, such as VoIP service, to send and receive calls. There can be some confusion between a DECT phone and a WiFi phone. These are two very different technologies and both have their advantages. Every DECT phone must be associated with a base station. The base station is what connects to the phone service to send/receive phones calls. Depending on the manufacturer there is the ability to register multiple handsets to one base station. WiFi phones will pick up a wireless signal directly to the device from your router. There is no need for any base stations or additional pieces of hardware. The distance you can be from your router will all depend on the strength of the signal being pushed out. With most WiFi phones they will be able to jump from access point to access point within your building. If you have wireless internet coverage throughout your building the WiFi phones should work wherever that signal can reach. Check with our solution specialists prior to your purchase to make sure. Depending upon building layout (concrete walls and other barriers) the cordless DECT 6.0 will be functional up to 400 feet. 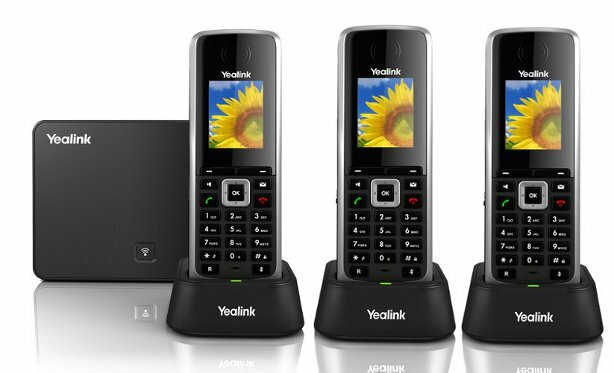 You are able to pair multiple DECT handsets to a single base station. Extending the range of the DECT 6.0 can be completed by using a repeater. On average a repeater can extend the range up to 150 feet. The DECT phones usually will have the ability to jump from base station/repeater to base station/repeater. When using a WiFi phone your call quality is representative of your router and access points. Also you will be competing against other voice and traffic over your internet connection. Although there are ways to prioritize your voice and data traffic, you still will come across issues with call quality. Also you will need to think about BYOD devices and how they will affect your WiFi signal. The DECT phone solution is not perfect but it should produce better quality. The DECT phones will be on another frequency and there will be no bandwidth issues as with WiFi. The DECT calls will not be interrupted by other data intensive applications in turn producing a better quality voice experience. Jeff is VoIP Supply's former Inbound Marketing Specialist.